On May 24, 1844, the parish was organized under the name of St. Mary’s Church, and services were held in various school buildings until a small church was built in early 1846 with the help of the Cheney brothers near the present site of Center Congregational. Later that year, the church moved to North Manchester to be closer to the majority of its members. In 1847, the parish encountered financial difficulties, the church was dissolved, and the building was sold. The members reunited in June 1851 and joined the Episcopal Church, establishing the Parish of St. Mary’s. During the period 1852 through 1869, the church struggled to survive, abandoning regular services and then re-establishing them, and finally closing in 1869. In the early 1870’s, members began worshiping in people’s homes. The church then purchased Center Academy from the Freemasons and moved the altar and pulpit from the old building to this new site. Regular services were re-established on April 5, 1874 (Easter). Five years later, a building committee was chosen to collect funds to build a new church. On June 26, 1882, a cornerstone was laid for the church on a site donated by the Cheney brothers. The first service in the church was held on March 25, 1883 (Easter), and the church was consecrated on June 7, 1884. In 1923, a building program was begun for a new church, but the Depression slowed the financing of the project. 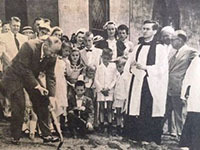 The effort to build a new church was revitalized in 1953, and ground was broken for the present church at the 10:00 a.m. service on July 10, 1955. Six months later, Bishop Walter H. Gray laid the cornerstone, and the new building (located on the corner of Park Street and Church Street) was dedicated on September 5, 1956. Bishop J. Warren Hutchens consecrated the church on November 3, 1971.